Reviewing is a key component to success. I constantly encourage my ninth grade Algebra students to review their work. Coaches are always reviewing game film to learn from the previous game. I would submit to you that reviewing financial decisions is an important aspect of living wisely in the area of finances. When I make a big purchase, I should ask if it were worth it one year later. If I change a lifestyle habit, I want to evaluate how it affects my bottom line a year later. One decision that I wrote about several years ago and wanted to review was my decision to switch cell phone providers to Ting Mobile. I started my review by reading the article and re-evaluating the pros and cons. This time I spare you the obnoxious puns. A pull-down offer will appear at the top of your screen shortly after you visit their website. At the time, I was anticipating a monthly phone bill of $39 per month without changing habits. Over the span of 18 months my bill has averaged just over $40, due to my usage being higher than average a few months. The rates have not risen which has been a pleasant surprise! My wife and I have had no surprises with reception. At home in Bellevue we experience great coverage, and experience no bars while floating down the Niobrara River in rural Nebraska. This would be exactly the same had we stayed with Sprint. We both upgraded phones during the past year (my wife to an iPhone 5 and myself to an even newer flip phone!!!) and changing our numbers over to the new phones was a piece of cake. The website makes it very clear what you will pay for. I switched phones midway through this year and did it all myself with ease. You may also want to see how Aaron is spending only $11.35/mo. on his cell phone bill. In 2015 I told you about the irony of cost with Ting. It is not for everyone. I searched average cell phone usage and by inputting the averages into Ting’s estimator tool, found out what a “normal” bill would be. Again,Ting is probably not a good replacement for unlimited talk, text, and data if you use all three in large amounts each month. As mentioned above, a person rolls with Sprint’s coverage for better or worse. Overall, there has been no significant surprises except for two pleasant perks. First, I have not waited in a line at a cell phone dealer for over 36 months now! By my “what it feels like” estimates that’s like many hours saved! Because efficiency is a high value for me and because lines at cell phone stores are the bane of my existence, Ting has worked out great for me! Secondly, Ting has made controlling my phone use easy. I’m able to set alerts when I reach a certain level of messages to warn me before I go over. If I go into “super strict crazy budget guy mode” for a month, I’m able to ask Ting to “cut me off” when I’ve had too many messages or data for that month. 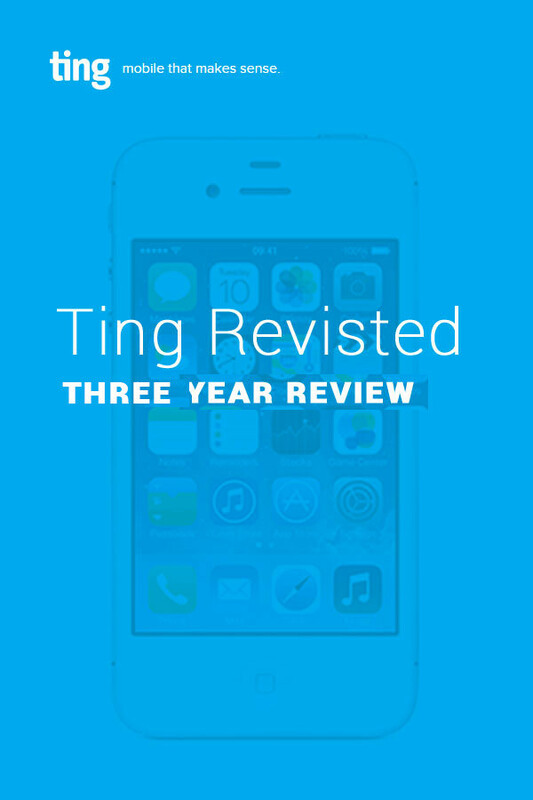 After a year and half of using Ting, my loyalty to the company is even stronger because of the lack of surprises, pleasant perks, and low phone bill each month! My insurance costs have gone up over the past 3 years. My electric bill has gone up over the past 3 years. With the family addition of a little one, the diaper budget has gone up exponentially over the past 3 years. But even after 3 years with Ting mobile, my cell phone bill is the same. This has led to more confidence and loyalty to Ting as my wireless provider. Cost. I pay for what I use. My wife and I don’t use our cell phones a lot, and therefore we don’t have to pay a lot! Our bill has stayed steady around $50 per month for the length of our time with Ting. Customer Service. I’ve never had to wait to speak with a Ting representative and 100% of my interactions have been with folks who know exactly what they are doing. And I don’t have to leave my couch to go wait in lines for the over-worked, stressed out folks in polos down at the local wireless shop who activate phones. No Contract. I’m nervous about any long term commitment (except my wife…don’t worry honey! ), so I’m glad I’m not bound by a cell phone contract that lasts over a year. While some of these contracts may work for some, I’ll take the freedom. Flexibility with Devices. Who doesn’t love a BYOD (bring your own device) network party? In my first post, I may have made it seem like Sprint phones are the only ones that can be carried over to Ting. That’s not the case – and we recently tested this out. We came across an iPhone that a family member was parting with that had previously been on a Verizon plan. We had to purchase a new Sim card from Ting (9 dollars), but after that the activation was smooth as well! Ting does a great job of letting you know if your device is compatible, and if not, how to make it compatible with their network. Updates. I can set up alerts to notify me when I’ve reached certain data, message, or minute levels. This can help me be for certain that I’m staying under the limits that I want to achieve each month. Three years ago I was really searching for what the ‘catch’ was with Ting. Today I’m resting confident that Ting will be my wireless carrier for many years to come. A pull-down offer will appear at the top of your screen shortly after you visit their website. TTG may receive a commission if you purchase via this link – at no charge to you. Thanks for helping to support our site. Update 8/4/15: One important detail that I failed to mention – Ting’s network mirrors that of Sprint but this year Ting’s coverage has expanded and includes GSM wireless coverage. Update 2/4/16: Consumer Reports again names Ting to one of the best MVNO providers. Update 8/5/16: Ting just announced they have dropped their pricing on all plans. Kind of unheard of today! Data now costs just $10 a gigabyte beyond the first. Kudos to Ting! Update 9/13/17: Ting offers a refer-a-friend program where they will give $25 to your referral (for phone or service) and $50 to you for the first referral ($25 for each referral after that). Update 2/7/18: Ting again takes top honors in Consumer Reports survey of top cell phone providers. Update 10/1/18: For a limited time, Ting is offering TTG readers a $50 credit when you sign-up for cell service. Click on the green button above to take advantage of this offer! Update 4/5/19: Ting is offering to fix new / existing customers’ phones when it gets cracked / broken (at least reimburse you the cost of repairs) – up to $150. You will be required to purchase a Ting plan OR add an existing line to your account, if you are a new member. Sweet! More details. This does not even come close to Twigby’s offers. If you are truly frugal, why would you have ting? they are crazy expensive. Glad you are happy with Twigby, Jorday! Since May 2018, how are others with GSM phones doing with Ting? I’ve had it for 3 yrs and it used to be great. Since around May of this year, it has been horrible. I am 3 blocks from a tower, on a high floor, and I only get 2 bars at my workstation, 4 bars but a long delay in dialing in my bedroom. The phone does not ring, people tell me it goes straight to voicemail. Ting said T Mobile modernized the towers to all be voiceover LTE. Well fine! My phones can handle that. But Ting apparently does not. I’ve tried literally 6 different phones and got a new SIM from them. This morning, there were 20 voicemails I did not know I had. I still have to go in my bedroom to dial a number and hope it doesn’t drop when I go to my desk. It’s barely any better anywhere else. I am thinking of doing Freedom because I am now spoiled with only paying for what I use. Anybody else having trouble in the last few months? There’s one big benefit from Ting that isn’t mentioned. We’re moving to Europe and I found out that all the major US carriers (and probably most of the MVNOs) cut you off if you use the phone outside the US for a period of time (two or three months) and don’t use it in the US. That makes it very difficult if you are running an existing US business outside the US or even want to keep a US number for other reasons. Ting allows transferring a US number to their service and allow unlimited international usage. While data is too expensive overseas, a local phone number can be used for a data plan. And, when you visit the US, you aren’t paying crazy rates for using a phone from another country. Interesting! Thanks for sharing your experience with Ting. I am so confused about phone service deals. my iPhone is old and slowing way down. We have 4 phones on our plan…3 Smarts and 1 Dumb! Currently we are with Sprint whose customer service is not great. Fortunately I have a guy in the retail store who haps me a lot. 3 of us use a lot of minutes, texts and have gone over ur 8G data. The plus with Sprint is that there are no overage charges, only slows down from 4 to 3. 2 of the phones are old and getting slower and one freezes up constantly, siri no longer works nor does voice texting. Any ideas. I’m paying around $250/mo. I want lower but need a plan that services our needs. Hi Lynne. There’s a lot out there to be confused about! If you are in a metro area / have access to WiFi a lot – my bets are on an MVNO (mobile virtual network operator). These guys piggyback on the larger networks and “rent” space off them and then turnaround and offer a better deal to the customer. Ting, Tello, Republic Wireless and Twigby are ones we have used / recommend. I use Tello (pay for 200mb, 300 min and unlimited text /month at $11.40/mo) and like them because you can build the plan you need. Many others are like that too. Tello also offers discounted phones / refurbished phones for less too. Hope that helps! I do think Ting is a good option for people who want to keep their iPhones; I know that’s a sticking issue for many people. I prefer Google Fi myself; it really just comes down to what pricing structure and phone features you’re looking for. But all of these no-contract carriers are a better deal than a $200/mo contract with blood-sucking Verizon or AT&T!! Agree to that last comment! What makes ting unique is it’s ability to call and text all internal numbers with no additional plans or charges. This is why I choose it ad Ihave family in the Philippines. I don’t think amy other discount cell company dose this. Most of them don’t even offer texting to the Philippines. Not impressed. They took over my former cell phone service on my second phone and are expensive for what you get. If you have a dumb phone, this will work for you, if you don’t do much. If not, unlimited thru another service is way cheaper. If you are using this service, don’t use it much. What’s the point. Also, they tried to tack on an extra 3 weeks onto my bill after it was cancelled and turned off. There are much better options for pricing. This includes Tello which uses the same lines that Ting uses with Sprint. Another option is the before mentioned Freedompop. Freedompop if you turn off all the renewal services and upgrades actually can be free for the passive user and also supports GSM phones. Ting is somewhat of a scam. It tries to lure you with what it touts as cheaper plans. However, it doesn’t compare itself with the THOUSANDS of MVNO services out there. That itself is a problem for the consumer thinking that it is saving money but is actually bleeding money out the wazoo when compared to the likes of Tello and Freedompop both of which don’t require a contract. Ting’s data and text surcharges are astronomical when you do either/or. That’s how they get you. Imagine if some spammer were to get a hold of your number and sends you a couple of text. Guess who gets billed. YOU. Ting makes it money on volume. It doesn’t serve the general consumer as it has some to believe. You can turn off the messages and data. I have used freedompop, textnow, ringplus (defunct), republic wireless, metropcs and recently, because of ringplus, ting. I would say for light users or people trying to keep their number, freedompop (sometimes waives fee) or google voice with their $20 port in fees make the most sense. 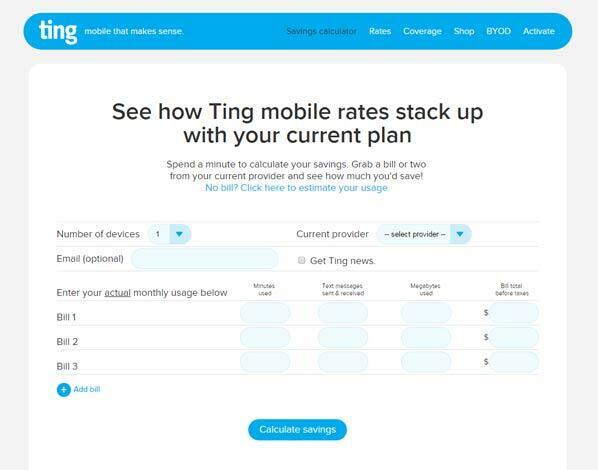 If you don’t need data and don’t mind buying a phone, republic’s $15 plan or textnow’s $14 plan are better than ting, if you just use a single text on ting, your bill would be $9 plus tax. For heavier users, a metropcs or cricket $30 plan blows ting out of the water. Unless you have an older phone you really want to keep to send 2 texts per month, ting is useless. It’s great if you can control yourself – if you can’t, it’s basically unlimited everything, and the more you use, the more you pay. And even though it’s correct that “You only pay for what you use”, the tiers are kind of big, so for instance you pay the same for voice whether you use 101 minutes or 500 minutes – a familiar drawback of traditional plans that Ting hasn’t quite gotten beyond. Ting is *not* a good idea if you want to get multiple lines on one account and control family or business usage, as I learned firsthand. You can set up alerts and caps, but doing it is EXTREMELY tedious, and Ting can’t guarantee caps will kick in in time, which can push you into a higher more expensive tier. Apperently for various reasons, if you’re in the middle of a call or a download when you go into the next more expensive tier, they can’t/won’t cut off the call or interrupt the download. I think that’s pretty much how all cell networks have always worked, and it’s always worked fine until Ting came along and set up a pricing scheme that doesn’t play nice with that reality. Ting suggests that to reduce the chances of being bumped into a more expensive tier, that you set a cap to kick in before the next tier; for instance cut off data at 475 MB so that you aren’t likely to go over 500 and into the next tier. But that only improves the odds; it doesn’t guarantee it’ll work, and the earlier you set your cap, the more money you’re wasting on minutes or data you’ll never use. I actually followed their advice to stop data at 475 MB and still ended up hitting 509 and a more expensive tier. Another drawback for family/business use is that if caps are in place, there’s no way to find out how much you have left for the month unless the main account owner logs in and looks; there’s no code you can text to see usage like most other carriers have. You can (tediously) set up alerts to warn when getting close, but they don’t say how much is left. Ting does have excellent customer support and great pricing if your usage fits their model. But I would never recommend it for anyone who wants a family/business plan and wants to control usage. P. S. If you’re looking for a carrier that can be even cheaper than Ting and has simpler more traditional plans and pricing, look into US Mobile. I’ve been using them since I gave up on Ting and so far so good. Like Ting they also have great support. 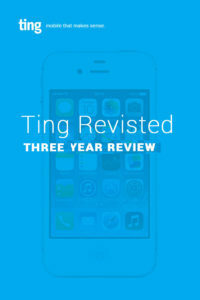 I have had Ting for a little over three years now, and I continue to be impressed with their service and savings. When I switched to Ting from Verizon I ended up paying the same price for 3 smart phones on Ting as I was paying for 2 dumb phones on Verizon. I recently upgraded to an new iPhone and it was so easy to do on Ting. I love ting, and have had it for over two years. There are two problems that ting has. 1st) when you have two lines on a program and shared minutes, when one line calls the other line it uses double the minutes! So, when I call my husband, and talk for 5 minutes, his phone used 5 minutes and my phone used 5 minutes. 2) With other cheaper options for unlimited data, the rate tiers haven’t kept competitive. Depending on the amount of data used it is not the best deal. Thanks for sharing your experience with Ting, Ruth! As an experiment, I switched my wife’s flip-phone (off contract) from Sprint to Ting! and even though she was only paying about $35/month, there was still a considerable savings of around $15/20 month depending upon usage. Later on, I got my 12yr old an emergency flip-phone and the bill is typically $9 a month because he never uses it. I took advantage of the TING referral credit and my wife’s account got a $75 credit and my son got $25. Then my wife got promoted and needed an Iphone … literally, she needed one for work because it’s an all-Apple environment where they’re making Apple apps and I took advantage of a Ting promotion and got an Iphone 5C for $100 off ($200 paid in total after discount). However, since my wife didn’t care about her old phone number, I created a new account and got my son’s account a $75 referral for his account, which is basically 6-7 months of free service. All in all, we’re happy with TING. The only con is that you have to pay $6/month for an inactive phone. If they either lowered that fee or eliminated it, I’d say TING would get a perfect 10 for our family needs. Thanks for your sharing your experience with Ting Andrew! Much appreciated. I’ve heard great things about Ting from Philip Defranco on youtube, I just wish they had something similar in Canada.